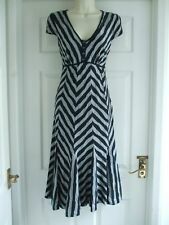 SPEZIALE PER UNA JACQUARD FABRIC BLACK/WHITE PRINT SHORT SLEEVE DRESS UK 8 IN AN EXCELLENT CONDITION. VERY GOOD CONDITION. Fully Lined. Beautiful pencil dress by Per Una. Size UK 18. This is a lovely dress from Per Una in size 14. The dress is sleeveless and has a concealed zip at the back. The dress is in a brown and black textured fabric and is fully lined. There is a small faux black flat bow also. This is a gorgeous dress from Per Una at Marks and Spencers. Very flattering. Wrap style dress with a top later of floaty chiffon type material. The fabric is beautiful and it has a devore print. Beautiful & Flattering Occasion / Career dress by Per Una. A wardrobe staple, wear this for special occasions as well as to the office. Excellent Condition. The black one is lined and is from Boden. The navy floral dress is from Per Una. Both dresses are in excellent used condition. Debenhams Collection brown fitted sleeveless dress with feature vee neckline. Good quality fabric, well made. Sleeve: sleeveless. Dress type: shift, pencil. Colour: brown. Per Una M & S Red Fitted A line Wiggle Occasion Work Midi Length Dress Size 10. Good Condition Measures approx . length 41" .chest 34" .sleeves 17" Dispatched with Royal Mail 1st Class Letter. 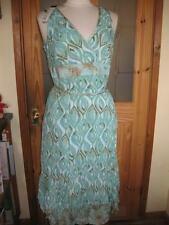 Length (shoulder to hem) approx 38". Gorgeous Per Una dress. Not your style, Size, Colour?. Fabulous for the office. Per Una black and white bodycon cap sleeve dress with concealed back zip, fully lined. Very flattering. Ideal office wear. Machine washable. Length (waist to hem) 25". Length (shoulder to hem) 38.5". PER UNA Marks and Spencer. Black with red, pink, green, yellow & purple Floral Pattern. Length 38". Red Contrast Hem. Dark grey, light grey, red,floral. easy to wear comfortable dress. slightly darker than photos show. Condition is Used. Also colour is subjective and can be affected by the settings on a computer or the lighting used when photographing. Underarm to underarm when flat 17". PER UNA BLACK, GREEN AND CREAM SOFT STRETCHY DRESS WITH GATHERED DETAIL ALONG THE FRONT NECKLINE. TIE-BACK FEATURE AT THE WAIST AND A SECTION OF SOFT GATHERS AT THE CENTRE FRONT. Black and Grey Wrap Style Dress With Ties Stretch Material . Condition is Used. Dispatched with Royal Mail 2nd Class.